← Albanian Students Revolt: What Is to Be Done? Note from LeftEast editors: This interview originally appeared on the Revolution Permanente website. 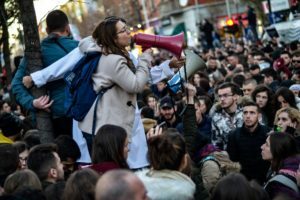 Albanian students are protesting en masse against a new hike in tuition fees in one of the poorest countries of the continent. While the medium wage in Albania is 350 euros per month, the tuition fees can go up to 2000 euros per year. Government wanted to make students pay for retake exams but it was forced to retreat to try to calm down the movement. But it seems not enough. 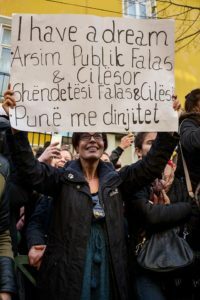 We interviewed Redi Muçi, lecturer at the Faculty of Geology and Mining and member of Movement For University (Levizja Për Universitetin), one of the organizers of the protests. What we are witnessing these days is the direct effect of the neoliberal reform in education that was implemented since July 2015. This reform was based on the idea that competition between universities in order to generate their own funds will lead to an increase in quality. In fact, the only thing that was bound to increase was the tuition fees. Thus, this semester, an extra fee was added for students who are retaking an exam. This was the spark that burned down the city. It started at the Faculty of Architecture and Urban Planning, and the next day brought 15.000 students in front of the Ministry’s doors. The list of demands starts with lowering tuition fees and increasing government spending for education, and goes on to include many other demands, such as better dormitories, removing corrupt professors from university, investing in laboratories and libraries… the list goes on. 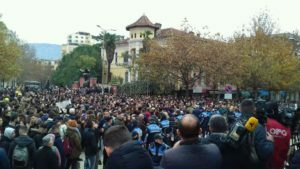 Për Universitetin is one of organizers of the demonstrations in Tirana, what are your claims? The Movement For University has been organizing numerous protests against this reform since 2012 when the idea was initially pitched, instead calling for a tuition-free public education. We have also raised many issues faced by students in their university life, issues such as poor infrastructure and various abuses by lecturers that are frequently voiced by students during these days of protests. The Movement considers that the only path to follow for the students is to reject any attempts for negotiating with the government and unequivocally calling for the abrogation of the existing law in education as the cornerstone for the initiation of a new reform that will be primarily based on the demands of the students. How is the life of Albanian students today? Many students in Albania live in dire conditions. The tuition fee is one of the highest in the region, especially if one considers the average wage in Albania. Students do not have the benefit of a discount on anything at all. The dormitories resemble catacombs of previous centuries. They are run by party exponents who want to gain the maximum with zero investments. If one adds to this the miserable infrastructural conditions of lecture halls and libraries, their revolt seems long overdue. How is the movement organizing? There are assemblies or places to discuss and organize? The student protest has reached unprecedented proportions that were impossible to predict. At the moment there is a kind of positive chaos presiding over the daily protests where various pockets of chants have formed. The biggest problem right now is the incessant attempts of opposition parties militants trying to divert the energy according to the agenda of their party. This has spurred physical confrontations in many occasions with our activists, who gratefully have the support and protection of the mass of students. Nevertheless, there has been a fascinating coherence in the students’ rejection of any negotiations with the government and any involvement of political figures from opposition parties. Workers won in Audi Hungary: “We hope .. Protests in Hungary: “The slave labor ..
Why is this a Scandal? Two Swiss-Kosovar .. The 1968 Student Revolt in Yugoslavia: & .. The Yugoslav students on the wave of rev ..
What is the answer of the government? Initially the Prime Minister called the students “dunces” for whom the taxpayers should not have to pay extra money. This, however, backfired spectacularly and ever since he has changed his rhetoric trying to lure in a negotiating team from the students, in the attempt to appear as if he is very concerned with their demands. Yesterday (8th of December) the Minister made an attempt to approach the crowd, but she was booed off the square. In France students are blocking universities, organizing protests also against fees hikes for foreign non-European students; they understand that it is a step before a general fees hike for students. Which message would you like to send to student’s movement in France in link with your mobilization? The students in France are rightly concerned with this new measure, looking back at the history of tuition hikes in England, where from free education the Thatcher administration initially increased the fees for foreign students, and later for everyone else. The “Anglo-Saxon” aura has been the sugar-coating of the neoliberal reform in Albania too. Our struggle is common! Just like the ‘gilet jaunes’, the students ought to resist this neoliberal wave that is sweeping over our societies.